In October 2017, three people were killed while working on an ammonia refrigeration system in Fernie, B.C. There are several lessons that can be learned from this tragedy and they are definitely not limited only to ammonia safety. We plan to discuss several of these lessons over a series of articles. However, we will begin by discussing ammonia system safety and maintenance with an overview of current safety and maintenance practices. Ammonia is a natural substance that has a very distinct odour. Most people can begin to smell ammonia at concentrations of approximately five parts per million (ppm). It is classified as a B2L refrigerant. This means it is toxic and has a ‘low’ flammability. We are going to ignore flammability for a while so that we can focus on toxicity, but a future article will bring us back to the flammability issue. Currently a refrigerant is deemed toxic if its occupational exposure limit (OEL) is less than 400 ppm. This OEL is based on time weighted average (TWA) concentrations that almost all people can be exposed to in an eight-hour workday and 40 hours per week. It can become a bit confusing because there are many possible sources of OEL information that an Occupational Health and Safety Authority (OHS) can choose to use, but the OEL of ammonia is generally accepted to be 25 ppm in most jurisdictions in North America. Ammonia is obviously below the 400-ppm threshold and so is considered toxic in this regard. There are some challenges with this rating method – imagine comparing two refrigerants, one with a 399 ppm OEL and one with a 401 ppm OEL; it’s hard to see why they should have a different toxicity classification. There is also a short-term exposure limit (STEL) that sets an occupational exposure limit for 15 minutes. For ammonia, this value is generally accepted in North America to be 35 ppm, although several organizations use 50 ppm. A third limit is called Immediate Danger to Life and Health (IDLH); OSHA considers this “an atmosphere that poses an immediate threat to life, would cause irreversible adverse health effects, or would impair an individual’s ability to escape from a dangerous atmosphere.” There are some significant challenges in determining this value and this definition is very broad. The National Institute for Occupational Safety and Health (NIOSH) is the organization that chooses these values and it is a complicated procedure outside of our discussion. NIOSH publishes the IDLH concentration of ammonia as 300 ppm. That level was chosen based on research and publication in 1943 and 1944. That said, the maximum tolerable concentration for 0.5 to 1 hour was 300 to 500 ppm. 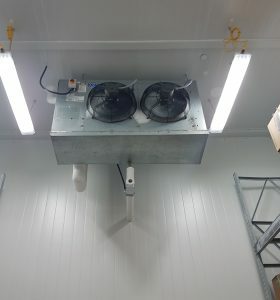 A small ammonia evaporator in a walk-in cooler. If the ammonia concentration is less than 25 ppm (TWA), you can be exposed for at least eight hours per day and 40 hours per week with no adverse health effects. If the ammonia concentration is 35 ppm, you can be exposed for 15 minutes at a time with no adverse health effects. If the ammonia concentration is above 35 ppm, you need to be using respiratory protection and a cartridge filter is acceptable. If the concentration is above 300 ppm, a worker needs to wear a self-contained breathing apparatus (SCBA) with a full facemask. Simple right? However, there are two factors that can make it challenging to know what Personal Protective Equipment (PPE) is appropriate. What is the actual concentration? If the concentration in the area you are entering is unknown, then it can be very challenging to justify what protective equipment is required. Occasionally, a facility will have ammonia detection at most locations that could be exposed to an ammonia leak, so this information is gathered from these sensors. But concentrations in a room can be wildly different depending on air flow and leak location. A personal monitor is always necessary to make sure the local concentration is known. What is the concentration going to be? This is a much harder question to answer. Several OHS organizations such as WorkSafe BC have implemented prescriptive rules or guidelines that lower the ammonia concentration in which a canister respirator is acceptable from 300 ppm to 250 ppm as a safety factor to account for the possibility the ammonia concentration could spike once you are in the room. I personally do not think this is an effective approach because the IDLH was already developed with a safety factor and was intended to be used as a decision point for when a self-contained breathing apparatus is required. 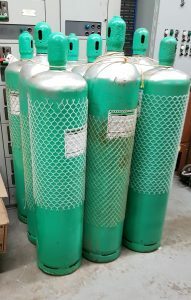 These ammonia cylinders are on site to top up a large blast freezing system. I think it is far more important to emphasize a proper hazard assessment by the workers who are responding to the leak. This means monitoring the ammonia concentrations and identifying the leak location as soon as possible. You could be in a compressor room that has a concentration of 300 ppm and discover a valve packing on a suction valve leaking and know that the risk of a sudden failure or large spike is small. Conversely, you could walk into a cold compressor room with a measured concentration of 200 ppm and find yourself standing in liquid ammonia that has frozen the floor. 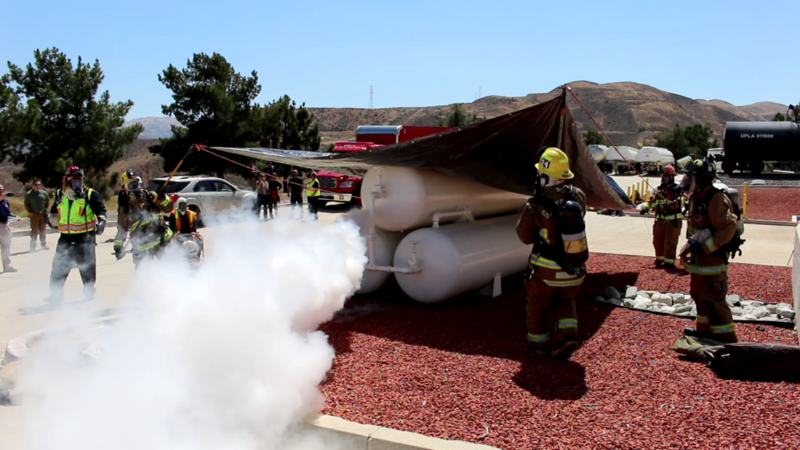 Both are realistic scenarios, and both require different levels of caution, response and protective equipment based on the actual leak and not the concentration of ammonia in the air. Ammonia is an inexpensive, efficient, and environmentally conscious refrigerant but it presents a unique safety risk compared to other non-toxic refrigerants. Because of its extensive use in industrial refrigeration, there continues to be a growing body of knowledge on safety, maintenance, and emergency response. With a likely transition to flammable refrigerants in several of our industry sectors, it will become important that we take these lessons and this knowledge to improve the safety of our refrigeration systems overall. In the next issue, we will take a look at maintenance, inspections and safety programs. Please note that this article is not intended to provide comprehensive safety advice and the author accepts no responsibility for any decisions made on the basis of the information provided.